A majority of the Palestinians killed during the “Great Return March” were linked to terrorist groups, according to an April 26, 2018 report by The Meir Amit Intelligence and Terrorism Information Center (ITIC). Yet, many major U.S. news outlets have failed to detail the extent of terrorist organizations’ involvement in the march. As CAMERA has highlighted, Hamas, Palestinian Islamic Jihad (PIJ), and other terrorist organizations helped orchestrate violent demonstrations at the Israel-Gaza border, beginning in late March 2018 (see, for example, “Hamas Uses Human Shields and The Washington Post,” The Daily Caller, April 4, 2018). 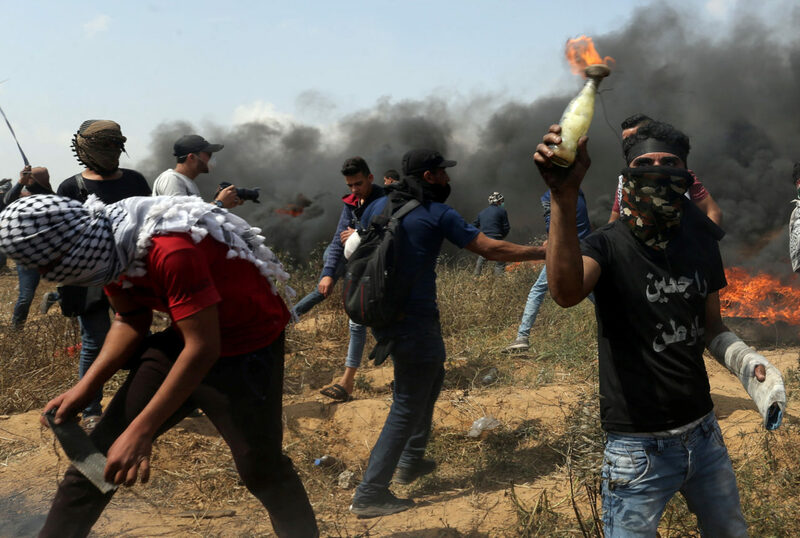 Billed as the “Great Return March,” the terror groups sent operatives armed with Molotov cocktails, firearms, explosives and other weapons, to try and violate Israel’s sovereign border. Many of these members were interspersed with unarmed Palestinians—human shields—in an attempt to create civilian casualties. Both Hamas and PIJ are U.S.-designated terrorist groups that call for Israel’s destruction. Israel has sought to target the terrorists with lethal munitions, while using other means to disperse the crowds of thousands that have gathered at the border under the auspices of terror groups. To thwart the vision of Israeli snipers attempting to target terror leaders, Palestinians have employed mirrors and burned tires. Nonetheless, Israeli targeting has been effective, according to the ITIC report. An analysis by ITIC found that “32 of the 40 Palestinians killed (80%) were terrorist operatives or individuals affiliated” with terror groups. Eighteen of that thirty-two belonged to or were affiliated with Hamas, and nine of that number were operatives of Hamas’ Izz al-Din Qassam Brigades—the so-called “military wing” of the terror group. One PIJ member was killed. The Democratic Front for the Liberation of Palestine (DFLP) and the Popular Front for the Liberation of Palestine (PFLP), both terror groups, had a combined total of three operatives and affiliates killed during the march. Fatah, the movement that dominates the Palestinian Authority (PA), also had several members killed at the border: Two “military operatives” and eight affiliates. Although Fatah is frequently described as “moderate” by some press and policymakers, it praises—and pays for—terrorist attacks. Fatah has also funded factions like the al-Aqsa Martyrs Brigades, which both the U.S. and Israel consider to be a terrorist group. Some media outlets, however, have failed to fully highlight the extent of involvement by Hamas and others in the march. The Washington Post’s Ishaan Tharoor, for example, failed to note that some of the Palestinians killed belonged to terrorist groups—even after Hamas publicly admitted that some of the dead were their operatives. Additionally, many in the press have uncritically repeated the casualty claims provided by Gaza’s Health Ministry—itself a Hamas entity. Accordingly, “the impression give to world public opinion is that all casualties were innocent Palestinian civilians,” as ITIC pointed out. ITIC’s report includes a listing of each terrorist operative killed during the march and their affiliation, along with other details, such as “memorial service held by Hamas” or “buried wrapped in a Hamas flag.” Among those listed is Yasser Abd al-Rahman Murtaja. Murtaja was a 30-year-old Palestinian press photographer and cofounder of the Ain Media production company. On April 6, 2018, Murtaja was wounded by IDF gunfire. He died the next day. Murtaja’s death occasioned considerable media coverage; embodied in headlines like The Washington Post’s “He was wearing a vest marked ‘PRESS.’ He was shot dead covering a protest in Gaza (April 7, 2018).” Some reporters, such as Fares Akram of the Associated Press (AP), described Murtaja as a “friend” and a “colleague” in an April 6, 2018 tweet. Many outlets did not wait to ascertain additional facts about Murtaja’s life or his death, although Palestinian terrorists have, at times, posed as journalists in order to attack Israelis (see, for example “Palestinian posing as journalist stabs IDF soldier in Hebron,” The Times of Israel, Oct. 16, 2015). On April 11, 2018, “unnamed Israeli security officials told Walla that Murtaja was a Hamas activist and active in the Hamas ‘security apparatus’s work on a daily basis’ to help the terrorist organization with intelligence gathering.” Subsequently, David Keyes and Ofir Gendelmen, both spokesmen for the Israeli Prime Minister’s office, stated that Murtaja “was not only on the Hamas payroll since 2011 but that he held the rank of captain and had a ‘prior association with the military wing [the Izzadin Kassam Brigades],’” The Jerusalem Post reported. On April 12, 2018 Keyes added: “I’ve seen the intelligence and there is not one scintilla of doubt about his being an officer in Hamas.” Israel’s Defense Minister, Avigdor Lieberman, also stated that Murtaja was a Hamas operative (“Defense Minister declares slain Gaza photojournalist ‘terrorist,’” The Jerusalem Post, April 11, 2018). ICIT, which has a separate open source report on Murtaja, concurred. The center noted that on Oct. 7, 2014, “Murtaja shared a post on Facebook showing a photo of Abdullah Fadel Murtaja [his cousin] in the uniform of the Izz al-Din al-Qassam Brigades. The post reads: ‘Allah have mercy on you, commando operative, we miss your smile.’” Murtaja’s cousin, Abdullah Fadel Murtaja, was not only a Hamas member; he was a “media operative” for the terror group who was killed during the 2014 Israel-Hamas War. In an online video from Oct. 14, 2014, Abdullah Fadel Murtaja appears in terrorist garb and states that he belongs to the Gaza City brigade of the Izz al-Din al-Qassam Brigades. After Yasser’s own death, Hamas officials made condolence calls to his family, ICIT noted. Some have expressed skepticism that Murtaja worked for Hamas, with The Washington Post publishing an April 10, 2018 report “Israel says slain journalist was a Hamas spy. The U.S. had just approved a grant for his company.” The dispatch implied that since the United States Agency for International Development (USAID) had given Murtaja’s Ain Media company a grant in March 2018, it was unlikely that he belonged to Hamas. Other outlets, such as The Jerusalem Post, noted that an AFP report said that some Hamas members purportedly assaulted Murtaja in 2015. Hamas, of course, regularly uses violence and intimidation—including towards their own members. And although the State Department has said that Murtaja was “vetted” for the USAID grant, it did not elaborate as to what that entailed. Nor does it necessarily mean that Murtaja didn’t work for Hamas; the United States has, on several occasions, even employed and worked with individuals later discovered to be terrorists. For example, Ali Mohammed was a founding member of Al-Qaeda, serving as its military chieftain and adviser while he was a U.S. Army soldier stationed at Fort Bragg, North Carolina (“Ali Mohammed: A Biographical Sketch,” West Point Combatting Terrorism Center). Mohammed enlisted in the U.S. Army after the CIA, which had previously used him as an asset, was aware of both his his terror connections, but did not inform the U.S. Army’s Special Operations school, which employed Mohammed. Similarly, Anwar al-Awlaki, the future head of Al-Qaeda in the Arabian Peninsula (AQAP), even participated in a U.S. Defense Department conference called “Islam and Middle Eastern Politics and Culture.” The future terror leader—who had already been connected to the Sept. 11, 2001 hijackers—was tasked with presenting the “moderate Muslim” viewpoint at the Feb. 5, 2002 conference (“FBI surveillance reveals terrorist-linked cleric Anwar Awlaki had a taste for pizza and call girls,” NBC News, July 2, 2013). As the terror analyst Peter Bergen detailed in his 2016 book United States of Jihad, FBI agents tailing Awlaki were shocked to find him participating in U.S.-government conferences, which even included FBI officials. Awlaki would later advise and encourage U.S. Army Maj. Nidal Hasan, a high-ranking Army doctor, to commit a terror attack at Fort Hood, Texas on Nov. 5, 2009. In short: a USAID grant to Murtaja’s media company does not preclude him from being a Hamas operative. Nor does AFP’s claim that Murtaja was detained and assaulted by Hamas members in 2015. Indeed, as CAMERA’s Tamar Sternthal has noted, AFP—which claims that it is committed to rigorous neutrality—has employed Nasser Abu Baker, a Fatah operative, as a journalist. Abu Baker has also served on the executive committee for the International Federation of Journalists (IFJ), which has accused Israel of a ‘covering up‘ Murtaja’s death. Although Abu Baker’s Fatah membership is clearly a conflict of interest with these two other organizations, neither AFP nor IFJ offered sufficient punishment towards him. The former merely suspended him for a week, and the latter criticized AFP’s decision to do so (“Corrupt State of Affairs at the International Federation of Journalists,” Gatestone Institute, Feb. 23, 2017). In fact, there is a long history of confusing servants of terror-linked groups with actual journalists. Fathi Hammad also participated in the “Great Return March,” according to a report by The Jerusalem Center for Public Affairs. As CAMERA pointed out in an Oct. 5, 2016 Washington Examiner Op-Ed, Hammad is a U.S.-designated terrorist who created a propaganda arm for Hamas: Al-Aqsa TV. Although Hammad and his network are linked to terrorism by the U.S. government, the Newseum, a Washington D.C.-based museum, memorializes several of Hammad’s employees as “fallen journalists.” The Newseum lists other terrorist operatives as journalists—with their names often appearing next to the victims of the regimes and organizations that they serve. The Newseum, refusing CAMERA’s calls to remove those names, has said that they compiled the list of fallen journalists with help from the Committee to Protect Journalists (CPJ), and other organizations. While many details remain unanswered about Murtaja’s life and death, ICIT’s report makes it clear that IDF targeting of terrorists during the violent demonstrations has been more precise than many media reports imply. Only twenty percent of the casualties have not been linked to terrorist organizations. By contrast, in the U.S. and coalition war against ISIS, an estimated 1,130 of the 3,000 killed in targeted airstrikes in Raqqa were civilians –more than one third (“What Raqqa Says About Gaza’s Death Toll,” Commentary Magazine, Oct. 27, 2017). ISIS, like Hamas, has a predilection for using human shields. Yet, it is often Israel—and Israel alone—that is charged with “indiscriminate” and “excessive” use of force. The opposite is true.